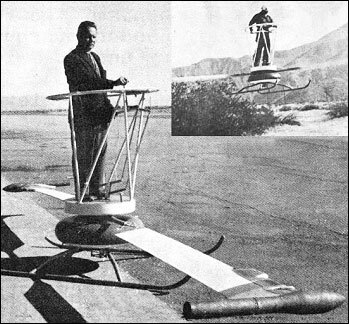 Eugene Gluhareff established a development company in 1952 to carry out research into pressure-jet powered light helicopters. 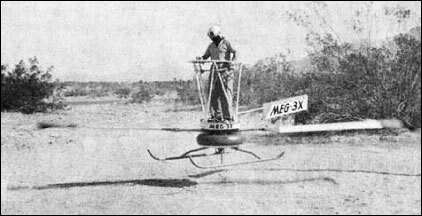 He built the MEG-1X personal strap-on helicopter rig which used a single-blade rotor with a tip-mounted G8-2 engine and followed this with the MEG-2X which had a two-blade rotor. 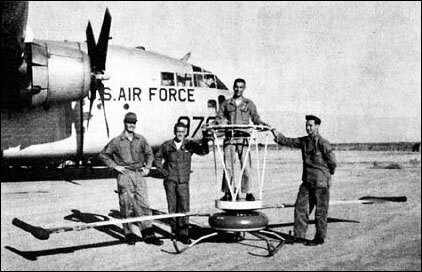 His final design was the MEG-3X which was based on a dish-shaped platform on which the pilot would stand and a two-blade rotor revolving underneath the platform. No commercial development was undertaken. That is one truly unique take on the whole personal helicopter thing. I wonder if you could implement the use of peroxide powered jets instead of propane ones. That makes for some Lawn Mower! There are no torque forces generated. The engines are mounted on the tips of the blades not in the body of the aircraft. The effects or torque on a helicopter derive as the result of the engine being mounted in the body of the aircraft. the rotational forces being applied to the rotors via a shaft. Because the blades have less mass than the body of a conventional helicopter the bladers rotate to provide the lift required. however the engine is also trying to rotate the body this is the torque force to which you refer and increases with the speed of the rotor which results in a need to counter this force using either the tail rotor or jet thrust applying force in the oposite direction. Since the forces generated by the Gluhareff engines are applied to the tips of the rotor which is connected to the helicopter by a freely rotating hub all the force applied to the blades when rotating is translated into lift and all the torque generated is used to rotate the blades, with none being applied to the body of the helicopter removing the need for a means of countering the torque forces. Friction in the rotor hub bearings would cause some problems with torque if not very effectively lubricated and you certainly would not want the bearings to run dry. Is no torque by the blades is only the friccion of the bearing.